This is a scheme run by Worcester Bosch and is offered to companies who are experienced and capable of undertaking the rigorous training and assessment in fitting Worcester products. If you are looking for a plumber in Carlisle or North Cumbria or Central Heating in Carlisle then G Sharpe Heating Solutions have met the standards of excellence required to be accredited with Worcester products. G Sharpe Heating Solutions became a member of the Worcester Bosch Business Initiative scheme in 2009 and since then we have developed a partnership with Worcester Bosch which means we can give a free extended parts and labour warranty. 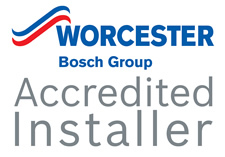 Our association with Worcester Bosch allows us to recommend the right product with absolute conviction. The support and back-up given from Worcester Bosch in our experience is unbeatable.